Our double room standard is decorated in a country style and were newly renovated in 2012. 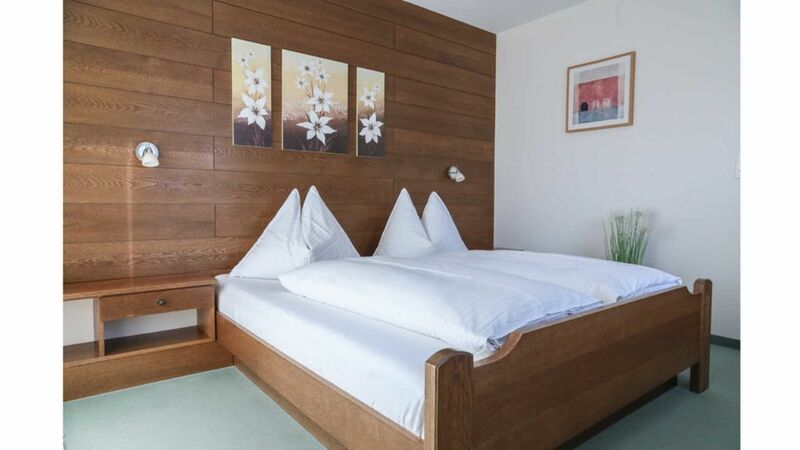 The location guarantees full day sunlight and belonging to the room balcony offers a wonderful view of the Mondsee. Enjoy your holiday from the first minute. The wonderful view over the Mondsee and the surrounding mountains will make you forget stress and everyday life quickly. Whether at breakfast at sunrise in the open air on the large terrace, the rich and lovingly prepared breakfast buffet, the afternoon chilling in the large, well-kept garden or exploring the lake and the place by bike or on foot - our quiet location, the clean, well-kept and newly renovated house with garden and lawn and the good facilities of the house make your holiday special. Holiday at the Pension am Mondsee - because you are worth it! Beim wunderschönen Ausblick kann man sich richtig erholen. Sehr sauber, ruhig. Bis zum Zentrum kann man gut spazieren. Vor Allem, man kann sich hier die schöne Aussicht gut tun lassen.